AUSTIN, Dec.28 -- Odessa's bruising Broncos return the state schoolboy football championship to West Texas here this warm and windy Saturday afternoon, trimming San Antonio Jefferson in a spectacular 21-14 scoring thriller that had 40,000 spectators limp and breathless at the finish. Never behind and never comfortably ahead. That was Odessa. Jefferson through the brilliant passing of Kyle Rote, wiped out a 7-0 deficit to gain a 7-7 halftime deadlock. But the boisterous Broncos stormed back with two third quarter touchdowns only to have their 21-7 lead fade quickly when Rote rifled a 56 yard touchdown pass to Robert (Sonny) Payne. There was made neither a threat nor a score in the fourth quarter. 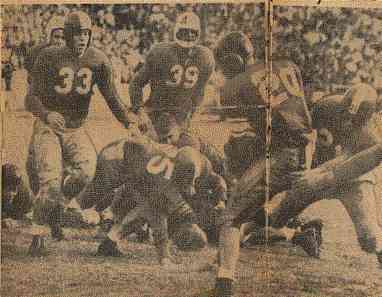 ; To give you an idea of the type of football entertainment the shirtsleeve crowd witnessed at Memorial Stadium in the 27th annual title game, 14 points were scored in the last 50 seconds of the third quarter. ; It was the waning seconds of that period that Byron (Santone) Townsend twisted across for an Odessa touchdown and Rote hurled the long payoff pass. 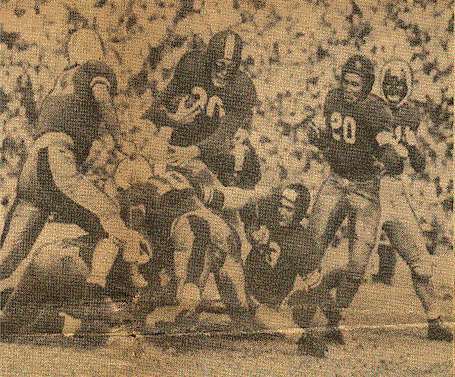 Yet had two vital plays gone the other way the Mustangs might have escaped with a 14-14 stalemate, thus preventing the Far-West Texans from racking up there 14th victory in as many 1946 starts. Here were the two plays: Odessa had move in front 14-7, in the third, and Townsend, in his effort to keep the kickoff away from Rote, spun a short kick some 20 yards off to a right angle. The ball bounced crazily and Odessa's alert Bobby Moorman pounced on it on Jefferson's 42. Odessa's opportunist went from there to the winning touchdown after an exchange of punts Jeff into a deep hole. A few plays later, Pat Knight, Jefferson's back who had been heralded as a pass defense genius. Chose to bat Townsend's end zone pass to the ground rather than intercept the ball. And on the next play, Townsend hurled to H.L. (Sonny) Holderman for the second touchdown. Mainly because of Odessa's superior line, all four members of the Bronco backfield finished ahead of Rote in yards gained rushing. Townsend personally rammed his way for 124, almost twice as many as all the Jeff backs picked up. Byron also made one touchdown, passed for one score and pinned many a beautiful tackle on the Mustangs. Harvey (Pug) Gabrel was never better as he lowered his shoulders and bored his way for 83 yards. Holderman hammered through the Jeff defense for 26 yards and Hayden Fry sneaked through them for 38. Workhorse forwards, Billy and Bobby Moorman, Wayne Jones and Steve Dowden, Harry Pace, Herman Foster, Gordon Headlee, and Glenn Taylor simply can not be praised too highly for their work in opening the holes so as to make the "T" of the Wild Hosses click, Neither did they stand around defensively. 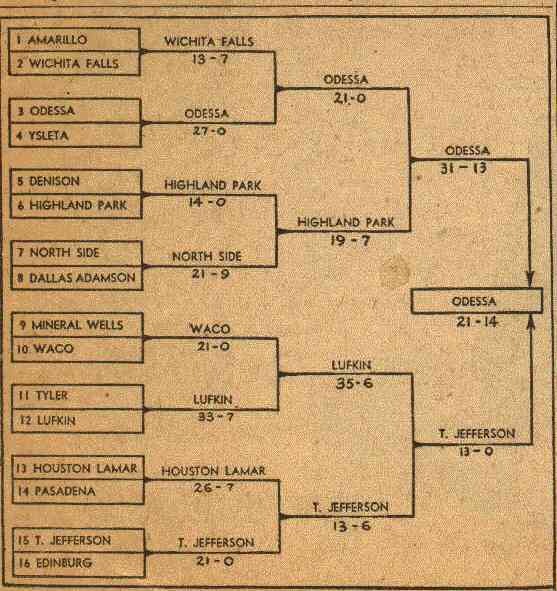 Center Damon Tassos, Tackle Richard Obregon and End Payne were the only Mustangs who came close to matching the heroics of the Odessa forwards. Except for this trio, it could have been one sided. Here's how the touchdowns were made: Odessa received and blasted 48 yards to Jeff's 21 before bogging down. Jeff made a first down before Rote kicked to Fry on Odessa's 16, and the Wild Hosses rode 84 on 19 plays without trying a single pass. Gabrel, Townsend, Fry and Holderman alternated at smashing through the huge holes opened for them, and finally the two Gabrel slashed the last two yards, slanting just outside Jeff's right tackle for the touchdown. Substitute Harold Dozier came in and kicked the point to make it 7-0 in the second period, the long drive having started in the opening period and ended a few minutes deep in the second. Gabrel and Townsend turned in some neat gains on this drive and finally Townsend tossed a running pass to Holderman for a touchdown. Holderman caught the ball while running diagonally across the goal line and fell across the arms of a Jeff tackler. On the previous play, Knight batted down Townsend's wild pass in the end zone. Dozier kicked the point again. After the recovery of the short kickoff, Odessa exchanged punts once and then drove 34 yards for the winning touchdown with Townsend going the last four yards on two tries. Holderman helped in this march with gains of six and seven yards. The Broncos wasted too much time getting ready for the point kick, and were penalized five yards. Substitute Jim Patterson's toe was strong and accurate enough to send the ball five extra steps and make it 21-7. On the first play after the next kickoff, with only 40 seconds remaining in the third quarter, Rote ran wide to his right, faded quickly and passed over the heads of Fry and Townsend to Payne, who gathered in the pitch on the 12 and streaked across. The play covered 56 yards. Rote added the point to leave it 21-14. Odessa missed by a yard making a first down on the 50-yard line in the last minute of play and Jeff took over. Knowing the dangerous Rote and his capabilities, the crowd held its breath and wondered if he would connect with another homerun pass and knot the count in that final minute. ; But Billy Moorman crashed through and tackled Rote for an 18 yard loss, on the next play Center Taylor batted down Rote's pass over the middle as time ran out. Odessa-Gabriel plunged for touchdown in the second; Dozier sub for Townsend kicked point. Jefferson-Rote ran for touchdown in second Rote kicked point. Odessa-Holderman caught touchdown pass from Townsend in third; Dozier sub for Townsend kicked point. Townsend plunged for touchdown in third; Patterson sub for Townsend kicked point. Jefferson- Payne caught 56-yard touchdown pass from Rote in third; Rose kicked point. Jefferson-Dresser, Meyer, McDougall and Piepers. Odessa-Pace, Dozier, Hill and Patterson. Referee, Jimmy Higgans (SMU); Umpire-Ray McCullough (TCU); field judge-Charley Hawn (Texas). AUSTIN, Dec. 28--"It was great--a lifetime ambition come true," said stubby little Joe Coleman Saturday after his red clad Bronchos won the state schoolboy football title. "Sure I was nervous," stated the ex-TCU quarterback in the dressing room. "That boy Rote is one of the best -- enough to make anybody nervous. I've got a great bunch of boys. "; As his victorious team whooped and yelled their victory cries, Coleman made preparation to go to Waco Saturday night to visit his mother. Odessa's entire team considered Saturday's victory their best Christmas gift of a lifetime. "Best present I ever had," grinned the Bronchos' pass catching end, Billy Moorman, the victories squad yelled their approval from the steaming shower rooms. One of the Jeff coaches leaving the room after extending congratulations to Coleman, was asked: "How do you like that boy Townsend?" "Today I liked 'em all," he remarked grimly, thus paying tribute to the great club which carried the state championship back to West Texas.